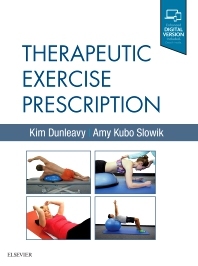 Dunleavy and Slowik’s Therapeutic Exercise Prescription delivers on everything you need from a core therapeutic exercise text. This all-new, full-color text combines evidence-based content, theoretical concepts, AND practical application to provide a robust understanding of therapeutic exercise. Using an approachable, easy-to-follow writing style, it introduces foundational concepts, discusses how to choose the right exercises, and guides you in developing goals for treatment. Coverage also includes the examination process and specific ways to choose, monitor, and evaluate the most effective exercise. Each exercise in the text is presented with progressions — a unique feature that’s exclusive to this title — to give you an understanding of how the exercise(s) may change from the initial phase of exercise prescription to the functional recovery stage. In addition to its highly-digestible format, this text also boasts case studies, practical discussions, and engaging online videos to provide you with the most dynamic and effective learning experience.